Do you have a funny feeling that you seem to be doing the same work over and over in your office? Do you have a funny feeling that you seem to be doing the same work over and over in your office? Grand projects are initiated with a flurry of meetings and earth shaking intentions, but amnesia sets in as soon as everyone steps out of the conference room. Or responsibilities are handed from person to person like a baton in a relay race, with a loss in context at every step, till they end up in the lap of someone who has scarcely a clue about the original intentions. Or files sent back and forth, till they settle in an obscure corner of the business never to be found again. And you end up doing the same work over and over, burdened with an overwhelming sense of déjà vu, when the exact same issues are discussed yet again in a meeting. I am certain this evokes pangs of personal experience from everyone. Many organizations suffer from this malady of broken collaboration. Some much of the time, some part of the time, only a few none of the time. Wouldn’t it be amazing if every project was realized systematically, graduating from inception to execution to fruition, without loss in time or resources or context? We would surely be so much more productive. In spite of being a technology company, we are amongst the first to admit that technology is not the sole panacea for the solution. Technology can be the backbone to help you implement the right things, or even open hitherto unavailable possibilities, but it needs to have supporting pillars. 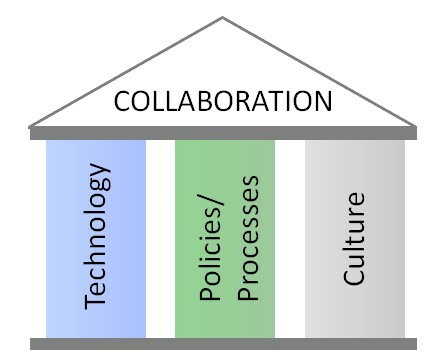 The following are the key pillars of collaboration. 1. Processes and Policies. The management needs to clearly lay out how things will be done. Who is responsible for what? What is the chain of command? What are the workflows and information flows? What tools will be used? With these basics ill defined, responsibility cannot be affixed, nobody is quite sure how they are supposed to achieve things, scores of cracks are created through which information may fall, and everyone ends up working at cross purposes. Ambiguity is the greatest enemy of collaboration. Processes need to have collaboration built into them. It goes without saying how much different departments (and further, everyone in the company) can benefit from each other. For example, Marketing and Sales interact with the market everyday, and have much valuable information for Product Development about user needs. But this sharing doesn’t happen nearly enough. Don’t expect Sales and Marketing to exchange information on a whim. They already have tons going on. Sharing therefore needs be built into the processes of Sales, Marketing, Product Development or any other department in the company. Technology is part of the picture, as it implements in practice what is laid out by policy. In the above example, Sales and Marketing should be able to log user feedback, which is forwarded to Product Development and made part of product development cycles. Other examples are workers being encouraged to store documents not on their desktop, but in the shared documents repository where they are available to everyone else. Or making sure that the project management system is used to set up projects, assign responsibilities, and update progress, rather than projects being handed down by worth of mouth and email, so that everyone has visibility of ongoing projects. Although many policies are implemented by technology, they precede technology, and ensure that everything aligns to organizational objectives. 2. Technology. Much of the work done in modern organizations involves information flows. Technology, or specifically information technology manages these flows, and makes sure the right people have the right information at the right time. Technology is therefore a key pillar in collaboration. This also explains the huge success of collaboration software, which ensures that workers have access to the information they need to perform their jobs. Technology can also open new avenues and possibilities which were unavailable before. For example mobile technologies ensure that workers can be productive even when they are at home or on the road. Or social collaboration tools which allow information to be displayed and shared in unprecedented democratic and viral ways which spurs collaboration like never before. Technology can therefore impact policies and processes, and even organizational objectives by opening new vistas. 3. Culture. Culture picks up where policies leave off. Not everything can be achieved through processes and policies, and may not even be desirable, as employees may feel stifled. Culture may be thought of as unspoken and unwritten policies, and yet an equally powerful tool for influencing behavior. A “collaborative culture” is a company where people are encouraged to step out of their formal work boundaries, and share information that may be of use to others. 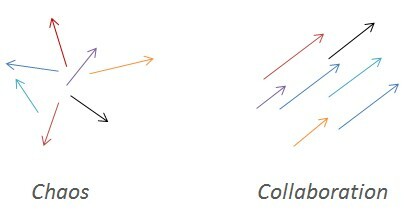 Collaboration is part of the DNA of such companies and employees are self-directing in their collaboration behavior, rather than being directed. SMB Group’s recent study titled “2011 communication and collaboration study” surveying over 700 decision makers found that companies with a “collaborative culture” actually had better revenue outcomes. Policies may help reinforce a collaborative culture. For example in the SMB Group study, companies which reward group achievement as opposed to individual achievement were said to have a “collaborative culture”. It is obvious from the above that none of the three pillars really exists in isolation. They all influence and reinforce each other. Companies which see collaboration as a desirable strategic outcome need to take this broader, multi pronged approach.